For less than $50, these small, lightweight wired earbuds offer strong noise cancelation and solid sound quality even in loud, crowded environments making them a good choice for commuters and heavy travelers. Noise-canceling technology is great for blotting out the world around you, but brand names like Bose and Sony cost a lot, especially for their bulky over-ear offerings. 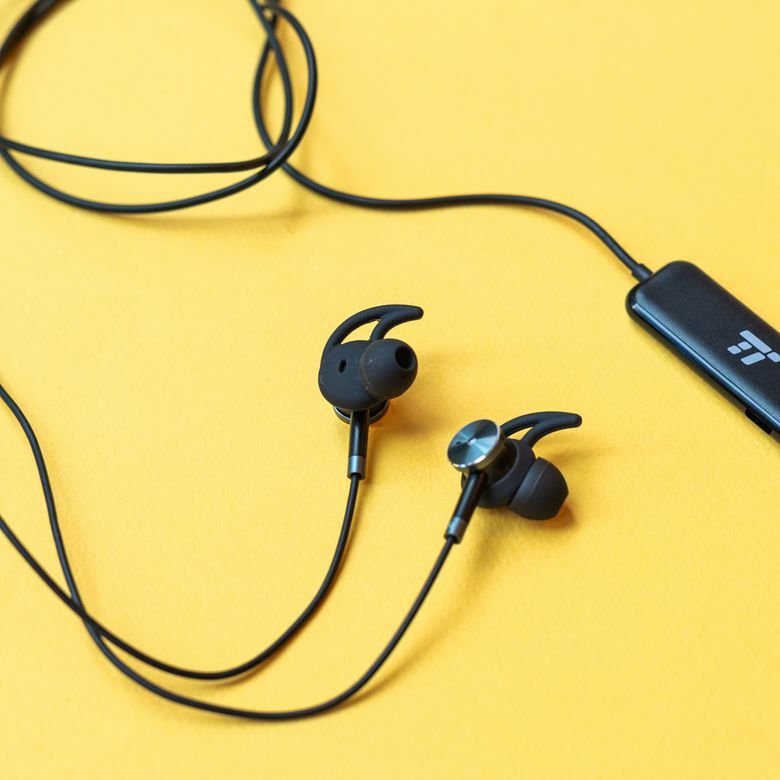 Fortunately, earbud-style headphones like the TaoTronics TT-EP01 Active Noise Canceling Headphones are smaller, lighter and cheaper, while still offering solid noise-cancelation. The sound quality won’t compare with more expensive over-the-ear options, but the TaoTronics only cost a fraction of more premium cans making them a great option for those on a budget. We recently tested the first-generation TT-EP01 wired version of the TaoTronics Active Noise Canceling Headphones. They cost less than $50 and tout noise cancelation, a rare feature for the price. In our testing, we evaluated all its promised features, including fit, design, battery life, and most importantly, its ability to block background noise. The TaoTronics are a stylish pair of silver-and-black earbuds made from a combination of durable machined aluminum alloy and plastic. Included are four pairs of eartips and four pairs of pliable rubber earhooks to help keep them securely in your ear. The interchangeable eartips and earhooks allow you to find your perfect fit while keeping the earbuds firmly fixed in your ear canal. The angled nozzles of the eartips also help with comfort for longer wear. All of this weighs in at just under 1.1 ounces and can easily fit into pockets and bags. The rubberized cable includes a three-button in-line microphone and remote as well as a separate housing for the Active Noise Canceling technology which is powered by a 140mAh rechargeable battery. The middle button, called the Multifunction button, uses a single click to play and pause music as well as answer calls. Hold that same button longer and you can use voice controls like Siri or Google Assistant. Click it twice to skip forward to the next song and three clicks to take you back to a previous track. The volume Up and Down buttons will adjust the volume accordingly while the LED light gives you battery charging status and alerts you when the ANC function is switched on. The microphone resides on the back of the remote for clearer phone calls. The included user guide that comes with the Taotronics is miserly. It offers a product diagram and explains how to charge the headphones, but we had to use trial-and-error to figure out specific features and controls. It’s important to note that the TaoTronics are wired earphones and need to be plugged into your audio source with the gold-plated 3.5mm headphone jack. Since there’s no Bluetooth technology if you have a smartphone without a headphone jack — an increasingly common omission on flagship phones — you’ll need a 3.5mm to USB-C or Lightning adapter. A two-pin airplane audio adapter is included for use with in-flight entertainment. For a sub-$50 product, the TaoTronics TT-EP01 Active Noise Canceling Headphones have good audio. You’ll enjoy succinct mids and deep, energetic bass — a big improvement from the shallower bass of cheaper products. The mids are both warm and crisp, though the headphones do have more trouble with the highs, which aren’t as clear. The TaoTronics are a stylish pair of silver-and-black earbuds made from a combination of durable machined aluminum alloy and plastic. The most prominent feature of the TaoTronics headphones is its Active Noise Cancelling (ANC) technology, which is controlled with a small switch on the side of the rectangular housing at the bottom of the audio cable. The technology works by listening to your environment and piping in matching sounds waves to blot out the sound. To get a better idea of how it handled different situations, we used the ANC on our commute in New York City as well as in an office environment. We found that it was exceptional at keeping out the surrounding noises of a subway train/station and on the street, but didn’t work quite as well with speech or sudden, loud noises. This caused a little bit of trouble in the office, but one simple solution we found was to swap out the included rubber eartips with a pair of foam eartips made for isolating noise, like the Comply Isolation T-400. They may not eliminate background sound entirely, but combined with the noise-cancelation technology you’ll be able to eliminate most of it. You’ll enjoy succinct mids and deep, energetic bass — a big improvement over the shallower bass of cheaper products. That said, other than the announcements on the subway’s loudspeaker, our commute was fairly silent, allowing us to peacefully listen to both music and podcasts without needing to raise the volume too high. On a full charge, you can use the ANC for up to 15 hours according to TaoTronics, which was similar to what we noticed. And even if your battery does run out, you’ll still be able to listen to music, just absent the benefits of noise cancelation. As a budget option in the noise canceling category, the TaoTronics TT-EP01 Active Noise Canceling Headphones are a great value buy, giving you a durable build and high-end ANC for under $50. For less than $50, these small, lightweight earbuds are a tremendous value, offering high-end noise canceling even on loud, crowded transportation. Other comparably-priced products in this category include the similarly-priced OVC Active Noise Canceling Earbuds and the slightly pricier Audio-Technica ATH-ANC33iS QuietPoint noise-canceling in-ear headphones. Also worth noting is TaoTronics' newer TT-EP02US model which offers similar features in a refined design for only a few dollars more. The TaoTronics TT-EP01 Active Noise Canceling Headphones boast better noise canceling technology than other competitors in its price range, especially for heavy travelers. The OVC Active Noise Canceling Earbuds offer effective ANC for general surrounding noise but lacks the deep bass or rich mids of TaoTronics. It also uses a fabric cord, which can be uncomfortable when it rubs against your skin. Check out our other reviews of the best headphones under $50, and our picks for the best earbuds available today. Get quality noise-canceling without breaking the bank. The TaoTronics TT-EP01 Active Noise Canceling Headphones are comfortable, capable earbuds which keep out background noise and last for up to 15 hours on one charge. Once you figure it out, the remote/mic gives you advanced controls, including the ability to use voice commands with your phone’s smart assistant. It’s an impressive set of features and one that’s rare to find at such a budget-friendly price.